A heart transplant is surgery to remove a person's diseased heart andreplace it with a healthy heart from a deceased donor. Ninety percent of heart transplants are done on patients who have end-stage heart failure. Heart failure is a condition in which the heart is damaged or weakened and can't pump enough blood to meet the body's needs. "End-stage" means the condition has become so severe that all treatments, other than heart transplant, have failed. The heart transplant process starts when doctors refer patients who have end-stage heart failure to a heart transplant center for evaluation. Patients found to be eligible for a heart transplant are placed on a waiting list for a donor heart. 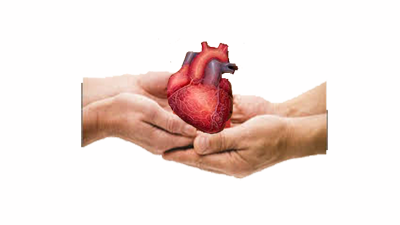 Heart transplant surgery is done in a hospital when a suitable donor heart is found. After the transplant, patients are started on a lifelong health care plan. The plan involves multiple medicines and frequent medical checkups. Who Needs A Heart Transplant? Who Is Referred to a Heart Transplant Center? Most patients referred to a heart transplant center have end-stage heart failure. Of these patients, close to half have heart failure as a result of coronary heart disease (also called coronary artery disease). Most patients considered for a heart transplant have tried other, less drastic treatments and have been hospitalized a number of times for heart failure. Patients who have the following conditions might not be candidates for heart transplant surgery because the procedure is less likely to be successful. Advanced age. Although there's no widely accepted upper age limit for a heart transplant, most transplant surgery is done on patients younger than 70 years old. Poor blood circulation throughout the body, including the brain. Kidney, lung, or liver diseases that can't be reversed. History of cancer or malignant tumors. Inability or unwillingness to follow lifelong medical instructions after a transplant. Pulmonary hypertension (high blood pressure in the lungs) that can't be reversed. Active infection throughout the body. What To Expect During a Heart Transplant ? Just before the heart transplant surgery, patients will get general anesthesia (AN-es-THE-ze-a). The term "anesthesia" refers to a loss of feeling and awareness. General anesthesia temporarily puts you to sleep. A bypass machine is hooked up to the arteries and veins of the heart. The machine pumps blood through the patient's lungs and body while the diseased heart is removed and the donor heart is sewn into place. Figure A shows where the diseased heart is cut for removal. Figure B shows where the transplanted healthy heart is sutured (stitched) to the recipient's arteries and veins. Heart transplant surgery usually takes about 4 hours. Patients often spend the first days after surgery in the intensive care unit of the hospital. Medication side effects. The immunosuppressants you'll need to take for the rest of your life can cause serious kidney damage and other problems. Infection.Immunosuppressants decrease your body's ability to fight infection. Many people who have heart transplants have an infection that requires them to be admitted to the hospital the first year after their transplant.